This is my first try at this house. I made this one not so scary, since it will be sent to my grandson. I have another one I'm working on and after putting one together I think the second one is going to look much better. Be watching for the second one. Now I have a favor to ask... I would LOVE for everyone to PLEASE take a minute and click the link below. Once there please LIKE my photo and leave a comment. I REALLY would APPRECIATE it. You can still leave a comment below as well. It too would be greatly appreciated. Inspire Me Fridays 75 - Anything Goes! WOW, this is so fabulous, Nana!! I just love it!! What an awesome Halloween project!! Your grandson will love it!! It's so amazing, I would keep it out all year :) Have a great weekend!! This is awesome!!!! What a fun project and great cuts!! Loving all the details you added!! Btw-happy mail came today...thanks soooo much!!! This haunted house is awesome! I like how it looks lite up. This is amazing! you did a great job on this! WOW this looks so cool!! You did a great job!! This is Super awesome!!! I just love all the elements. your grandson will love it. This is AMAZINGLY Crazy !! !I don't know if thats a word but I am saying it! 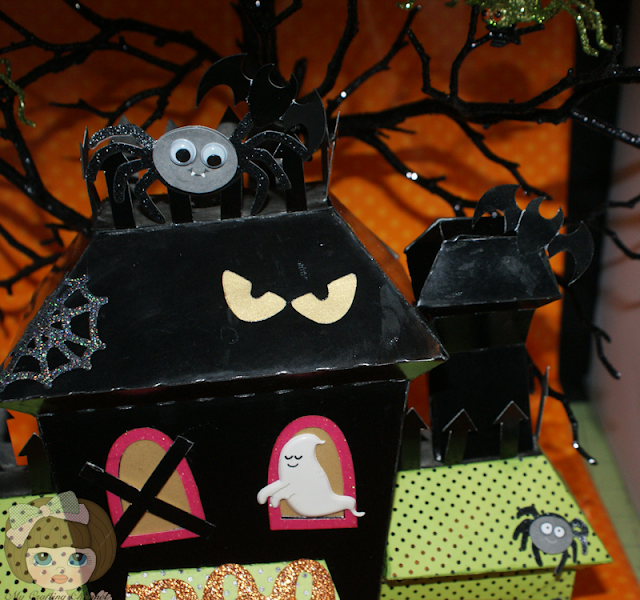 !The Cat,bat,ghosts and the googly eyes on the spider is AWESOME!!! !So Cool and Spooky Too! !You took a break yesterday...right?AND you post something like this?..LOL....AMAZING!! !Love it! Very nice job! Can't wait to see the next one. I love this spooky haunted house! I have been thinking of creating my own from milk cartons and other bits. Yours is awesome. I love that tree in the back too! This is super fun and spooky! Love all the details you put into this! Can't wait to see the next one! Sorry I'm not on FB! This is absolutely fabulous Nana, I love all the detail,very spooky, sorry I am not on facebook so cant see it over there. I like your haunted house - very nice work! 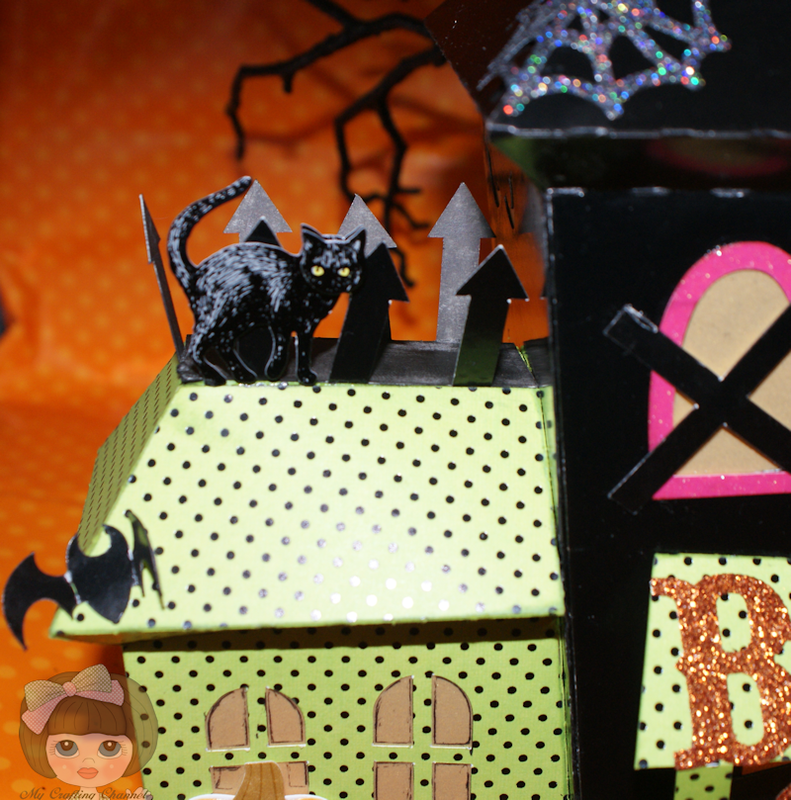 Your Haunted House is spook-tacular. 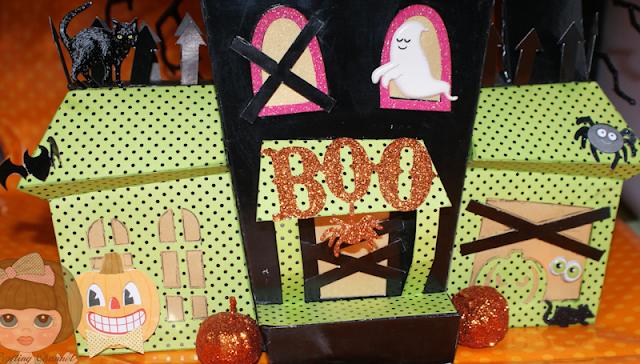 Not tried to make a 3D Haunted House or any such house. Bought styrofoam pumpkin for hubby to carve. Now to choose a new Pirate theme pumpkin carve design. Oh my goodness! LOVE this!! I am really getting into Halloween decorations this year for some reason and this one is amazing! So many fun details..and I love the green dotted paper! Scary or not its still sooo darn cute. Thanks for sharing, God bless. Happy Sunday morning you must be having a good weekend you are not here. How sweet of you to like my hexagon card, but I have no idea how to make a tutorial, I can tell you I looked up hexagon card with a cricut,(on youtube) and I did find one on there and it would take me a litte while to find the card I got this idea from, but mine is close,,,, if you do have any questions, I would be happy to give it a try! new follower,,,I'll be back to check out more. Lovely blog! I'm hosting a Fall into the Holidays link up and would love to have you join! Absolutely fantastic! The details are just so fun!! 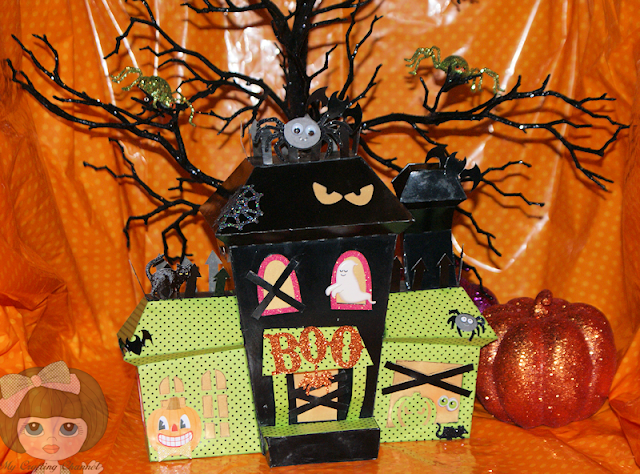 You should come over and enter this in our anything goes challenge at Docerela Creations! Deets are on my right sidebar! I voted for you my dear!! this is just WOW, awesome! I love every detail on it, great job! The haunted house is fantastic! Just went and liked it and left a comment, hope it wasn't too late!! !